Seanan McGuire is easily one of the best fantasy authors writing today. Her world-building is tremendous and her characters are first-rate. In Beneath the Sugar Sky we return to McGuire’s ‘Wayward Children’ series. This time we are introduced to Cora who, due largely to her weight, has been bullied when on earth. Cora wanders the hallways, looking for the doorway that will lead her back to the Trenches where she is a beautiful mermaid. We spend a lot of time in Confection in this book, which is actually quite fun. I couldn’t help but think of Hansel and Gretel, but without the witch, with everything sugar-coated and ready to eat. This book appears to be a little lighter than the first two books in the Wayward Children books, which works nicely since the first two were rather dark. But there’s still an edge to the world that reminds the reader that this fantasy land isn’t necessarily a place to want to live. Even Confection, that sugar-sweet land, has dangers in it. I’m constantly impressed with McGuire’s work and that she can be writing in different worlds and make them all seem so real and all so unique. In this book, and this series, we meet characters who appear familiar to us, but at the same time, we see a side of these characters that is more than just unique but a little bit on the frightening side as well. I’m struggling for ways to describe this book, and the series. It’s more than just a fantasy. It is familiar fantasy, but seen from an edgier point of view – the ‘what could happen’ point of view. This is definitely something I’d recommend to anyone who enjoys modern fantasy and modern fairy tales. Looking for a good book? 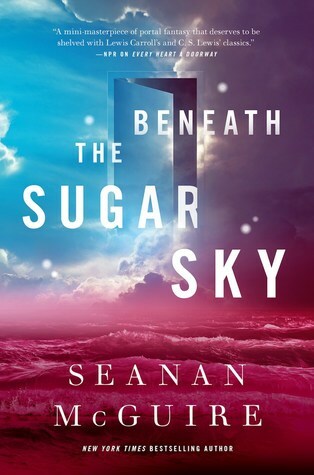 Beneath the Sugar Sky by Seanan McGuire is the third book in the Wayward Children series and continues to impress with the scope of the world building and the reality of the characters.